Experience the Christmas story as the Shepherds' saw it in this novelty Christmas tree decoration book. 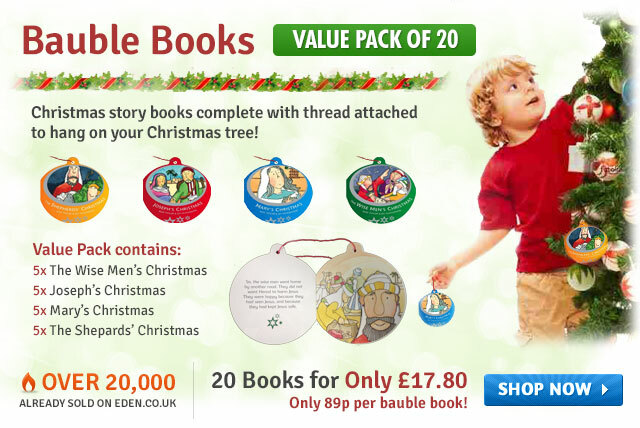 Suitable for 4-8's, the Bauble Book Series is always a popular church giveaway, along with the other three in the series. 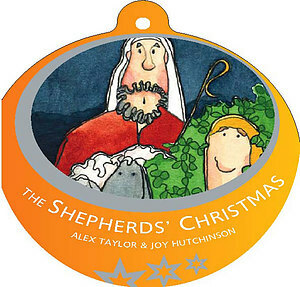 The Shepherds' Christmas Bauble Book is is a colourful Christmas tree decoration with a story inside. Telling the Christmas story from the Shepherds' perspective, the miniature book is suitable for children under 8 and a fantastic introduction to the real Christmas story for those with little church background, making the Bauble Book Series extremely popular for church giveaways at Christmas time. The whole set can be read together or individually. With all four books hanging from your Christmas tree, you and your children can keep the real meaning of Christmas alive in your house and in your hearts. The Shepherds' Christmas by Alex Taylor; Joy Hutchinson was published by Scripture Union in August 2010 and is our 13016th best seller. The ISBN for The Shepherds' Christmas is 9781844275175. These are lovely little stories, designed to hang on your Christmas tree. They are just 85mm wide, text accompanying an illustration on each spread and about 6 spreads. Bought the set to read to our youngest 'Children's Church' and hang on the Advent Tree. They love them, very colourful and easy read. Got a question? No problem! Just click here to ask us about The Shepherds' Christmas . A decoration and book in one! The Shepherds' Christmas retells the Christmas from the shepherds' point of view. The beautiful artwork makes it an attractive Christmas tree bauble as well as a great read for children under 8. The book comes with a thread to hang it on a Christmas tree. The Shepherds' Christmas is part of a four book set following the Christmas stories of Mary, Joseph, the shepherds and the wise men. The whole collection look very attractive hanging on a Christmas tree. The story is age appropriate for under-8s and sticks closely to the Bible in its retelling. It is ideal for use with all children, but is good to introduce the real Christmas story to those with little or no church background. Suitable for 4-8s.